The SKAO is moving towards finalising the detailed design of the SKA1 radio telescope which will culminate in Critical Design Reviews (CDR) for all the telescope products and associated infrastructure and power during the course of 2018. The detailed design is being undertaken by 9 Design Consortia from across the world. 512 stations in a large core and three spiral arms with a maximum baseline of 65km. The SKA1 Deployment Baseline will be defined in the SKA Construction Proposal which is currently under development. It will include as much of the Design Baseline as can be afforded at that time. The current Deployment Baseline is formulated on the assumption that €674M (2016 Euros) will be available. Scientific assessment of the proposed deployment baseline demonstrates that the SKA Observatory will deliver transformational science capabilities. Re-instatement of the omitted capabilities, up to the full restoration of the Design Baseline, is planned, either during or after the construction phase, should additional funding become available. The Deployment Baseline will be regularly reviewed by the SKA Science and Engineering Advisory Committee (SEAC) under the direction of the SKA Board. 476 stations with a maximum baseline of 40km. The implication for the SKA Land Acquisition Programme currently underway in South Africa is that the international SKA Organisation, working with SARAO, will implement the Design Baseline (133 antennas which includes 21 antennas and associated infrastructure and power in the three spiral arms at a maximum baseline of 150km). SARAO will therefore continue to secure Servitude Agreements with affected landowners on the Design Baseline to mitigate any uncertainty in the local communities with regards to servitudes and execute the land acquisition programme cost-effectively. The principle of this approach is to ensure the availability of land in the event that additional funding is secured by the SKAO through member countries to achieve the Design Baseline. The construction of SKA1 is expected to commence towards the end of 2019 when all the relevant construction licenses have been secured. The IEMP provides recommendations on the way in which the SKA radio telescope will be constructed and operated within the environment and the measures that will be taken to mitigate its environmental impact and enhance its environmental benefit. The IEMP is a living document adapted every five years according to changing requirements of the region itself and its users. The IEMP includes a monitoring and auditing programme that will be reassessed periodically to allow for an adaptive and dynamic environmental monitoring framework. The 2007, 2009 and 2011 Environmental Impact Assessment (EIA) reports and respective Environmental Management Plans can be accessed at www.ska.ac.za/about/strategic-environmental-assessment. The Internal Memorandum of Agreement includes several undertakings and deliverables agreed upon by SARAO and SAEON. 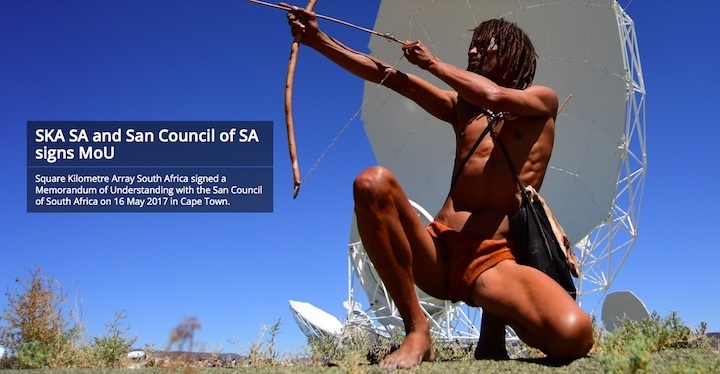 The agreement affects approximately 130,000 hectares of land in the Karoo area and the process of buying up land to accommodate the core area of the SKA has been concluded. Negotiations are underway to enter servitude agreements with landowners along the 3 spiral arms that stretches out from this core area. Undertaking an ecology, biodiversity and surface water (aquatic) site walk-through for SKA1_MID; developing an Ecological and Aquatic Management Plan for the SKA site based on the ecological and aquatic walk-through-findings; developing a Revegetation and Rehabilitation Plan and a Plant Rescue and Protection Plan for SKA1_MID; conducting an Environmental Baseline Study on the SKA site and the three spiral arms; provide advice to the Land Management Authority on preparing a motivation for the establishment of the SKA site as a Protected area; advising on the Land Management Plan to be developed by the Land Management Authority; and generating and distributing reports on the Land-Use Change Impacts on the SKA site. The MeerKAT and SKA projects in South Africa are part of the Strategic Integrated Projects (SIPs) programme under the National Development Plan (2012). The National Development Plan is intended to transform the economic landscape in the country, create a significant number of new jobs, strengthen the delivery of basic services and support the integration of African economies. The Department of Environmental Affairs (DEA) has committed to contribute to the implementation of the National Development Plan by undertaking Strategic Environmental Assessments (SEAs) to integrate the regulatory environmental requirements for the SIPs while safeguarding the environment. The Council for Scientific and Industrial Research (CSIR) was appointed to undertake a Strategic Environmental Assessment (SEA) of the SKA Phase 1 in South Africa. “to provide a platform to coordinate research and data collection within the SKA Phase 1 study area and integrate the environmental authorisation process ensuring that environmental factors are adequately considered and environmental principles implemented at the strategic planning stage“. The South African Radio Astronomy Observatory (SARAO) is a National Facility managed by the National Research Foundation (NRF) and incorporates all national radio astronomy telescopes and programmes. SARAO spearheads South Africa’s activities in the Square Kilometre Array Radio Telescope, commonly known as the SKA, in engineering, science and construction. The national radio astronomy telescopes and programmes incorporated under SARAO includes the MeerKAT and KAT-7 telescopes in the Karoo, the Hartebeesthoek Radio Astronomy Observatory (HartRAO) in Gauteng, the African Very Long Baseline Interferometry Network (AVN) in nine African countries as well as the associated human capital development and commercialization endeavours. SAEON is a business unit of the National Research Foundation (NRF) and serves as a national platform for detecting, translating and predicting environmental change through scientifically designed observation systems and research. SAEON also captures and makes long-term datasets freely accessible, and runs an education outreach programme. SAEON has six nodes dispersed geographically across the country. In South Africa, SEAs are undertaken to evaluate the opportunities and constraints of large scale strategic developments at the regional and national scales. To date, three SEAs have been commissioned in support of the SIPs: the Renewable Energy Development Zones (REDZs) SEA in support of SIP 8, the Electricity Grid Infrastructure (EGI) SEA in support of SIP 10 and the SKA Phase 1 South Africa SEA in support of SIP 16. The ultimate goal of a strategic environmental assessment is to define a sustainable development process which will meet the necessary human development goals while maintaining the ability of natural systems to continue to provide the natural resources and ecosystem services upon which the economy and society depend. 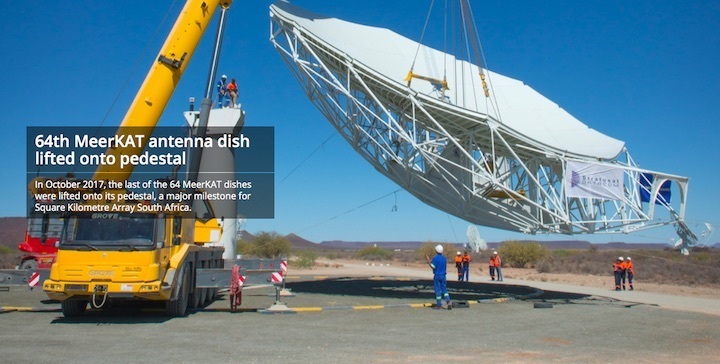 The MeerKAT radio telescope, currently being built by Square Kilometre Array South Africa (SKA SA) was recognised by the construction industry last week when it was presented with a Special Platinum Award at the 2017 Logistics Achiever Awards. The MeerKAT project is the inaugural recipient of this special award, on Thursday, 2 November 2017. MeerKAT is a 64-antenna array radio telescope under construction in the Karoo in South Africa and is a precursor instrument to the Square Kilometre Array which, when complete, will be the world’s largest radio telescope. This year’s Logistics Achiever Awards marked the 29th year of recognising and rewarding logistics and supply chain excellence in Southern Africa. The awards aim to recognise professionalism and excellence in the effective application of strategic, tactical, and operational logistics and supply chain management principles, concepts, and practices in Southern Africa; to encourage all companies and organisations in Southern Africa to review, evaluate and upgrade their current logistics and supply chain management practices; and to create a greater awareness and understanding of the value of effective logistics and supply chain management. “The MeerKAT project presented a number of challenges that encouraged our industry partners for which to find innovative solutions. This is a testimony that we are building a truly world class instrument,” says Willem Esterhuyse, General Manager: Engineering at SKA SA. Some of SKA SA’s industry partners in the construction of MeerKAT was present at the awards ceremony. The MeerKAT construction has as much as 80% local supplier and manufacturing component content and key local suppliers include Stratosat Datacom, Efficient Engineering, Titanus Slew Rings, Tricom Structures, Namaqua Engineering, Westarcor, General Profiling, EMSS Antennas, Group 5, Aurecon, NMC Civils, GCS, Peralex, Tellumat, Daliff Precision Engineering, Fabrinox and others. 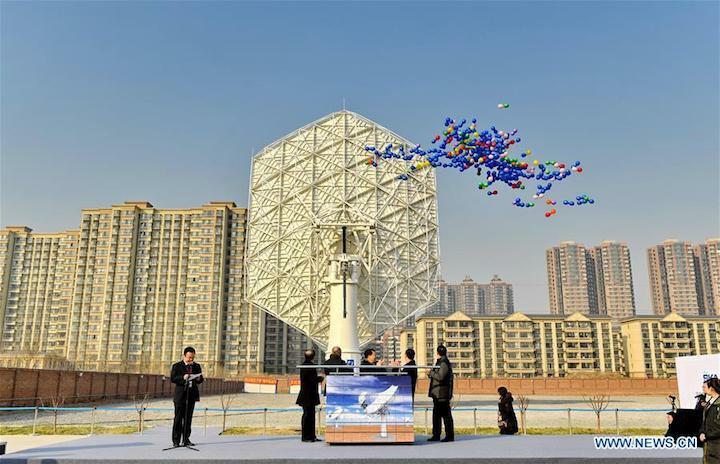 Shijiazhuang, China, Tuesday 6 February – The first fullyassembled SKA dish was unveiled today at a ceremonyin Shijiazhuang, China, by the Vice Minister of the Chinese Ministry of Science and Technology, in thepresence of representatives from the countries involved and the SKA Organisation. The dish is one of two final prototypes that will be tested ahead of production of an early array. 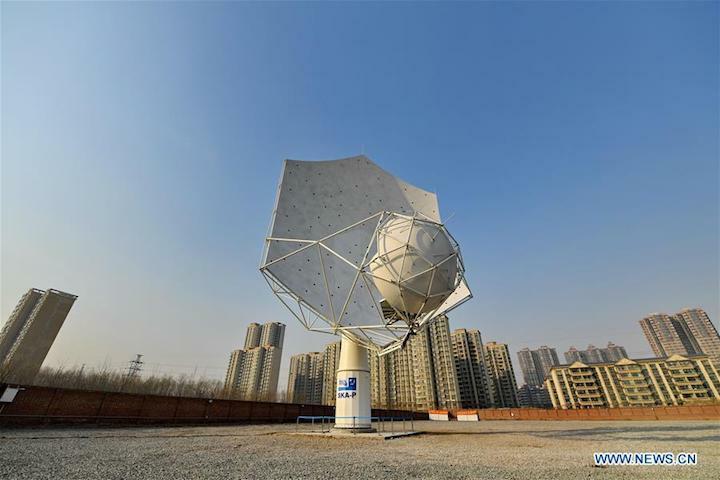 In a major milestone for the SKA Project, the 54th Institute of China Electronics Technology Group Corporation (CETC54) has completed the structural assembly of the first SKA dish, bringing together components from China, Germany, and Italy. The state-of-the-art 15-metre diameter dish was unveiled today at a ceremony in Shijiazhuang, China, hosted by the SKA Organisation and the SKA China Office and organised by the Joint Laboratory for Radio Astronomy Technology (JLRAT) and the SKA Dish consortium, supported by the Chinese Ministry of Science and Technology (MOST), the Chinese Academy of Sciences, the National Natural Science Foundation of China and the CETC group. 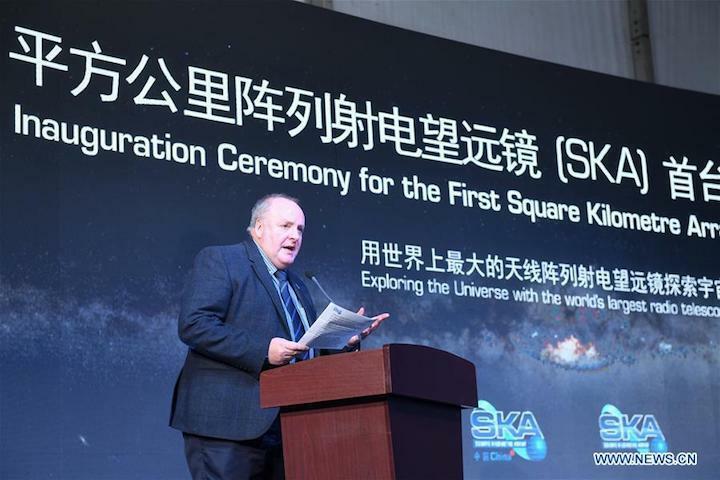 This year will see the culmination of a 3-year effort by an international consortium that includes institutions in China acting as the consortium lead, Australia, Canada, France, Germany, Italy, South Africa, Spain, the United Kingdom and Sweden, overseen by the SKA Organisation. Across 18 time zones, extensive work has taken place to reach this point as the various teams around the world work towards building a fully functional SKA dish prototype. CETC54 has been leading the design and production of the prototype dish, in particular the production of its highly precise main reflector, sub-reflector, backup structure, and pedestal. “This is a mature method developed by CETC54. 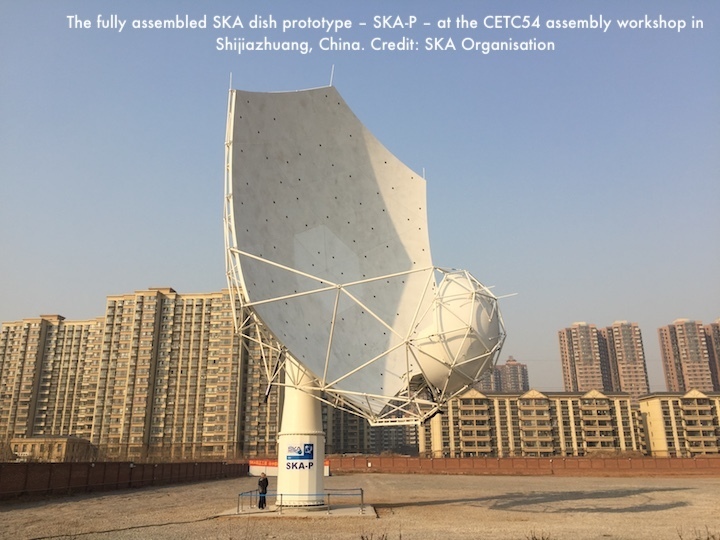 Applied to the SKA dish, it allows us to achieve and maintain the dish surface to a very precise surface-accuracy level as well as consistency for all panels”, said Wang Feng from the Joint Laboratory for Radio Astronomy Technology (JLRAT), recently appointed SKA Dish Consortium Lead. In Mainz, Germany, MT Mechatronics (MTM) have been designing and manufacturing the precise hardware and electronics – such as the Drive Units and Electronics – used to move the dish. “We’ve been entrusted with demonstrating precision engineering in order to move the telescopes with up to a thousandth of a degree accuracy, as well as reliability to produce over 130 such systems behaving equally well.” comments Lutz Stenvers, Managing Director from MTM and SKA Dish Structure Lead Engineer. In Italy, near Naples, the Società Aerospaziale Mediterranea (SAM) has been working on the design and production of the feed indexer, an electro-mechanical component that will support the various receivers and move them into position to align them with the optics of the dish when required, depending on the observations. “The feed indexer is a very innovative part of the dish, the first of its kind. We’ve got stringent requirements, as the indexer needs to move with high accuracy to position the receivers with sub-millimetric precision, and it also needs to be able to sustain heavy loads, with for example the Band 1 receiver alone weighing 165kg” explains Renato Aurigemma, the SAM team coordinator. Today, for the first time, all these components came together at CETC54’s assembly workshop to test how the structure as a whole behaves. A second dish, currently under production at CETC54 and funded by the German Max Planck Society, will be shipped to South Africa and assembled at the South African SKA site in the next few months where it will be equipped with its instrumentation and used to conduct real observations for the first time to test its performance and calibrate all the systems. Onsala Space Observatory at Chalmers University of Technology, Sweden, EMSS Antennas in Stellenbosch, South Africa, and Oxford University and the Science and Technology Facilities Council (STFC) in the United Kingdom have been working on the various receivers that will be fitted on this second dish, covering a broad frequency range from 350 MHz to 15.3 GHz. Additional institutes involved include the Italian National Institute for Astrophysics (INAF), who are developing the software to monitor, coordinate and control the Dish subsystems. A group of engineers at the National Research Council (NRC) Canada, are developing the hardware that digitises the signals recorded with each of the five receivers while The University of Bordeaux, France contributes their expertise to digitise high frequency signals. SKA South Africa has been leading the System Engineering, which played a key role in coordinating the consortium. The SKA prototype dish unveiled today is being delivered as part of the consortium’s critical design review – the final stage of design work before construction. It and the Max-Planck funded dish, are the final precursors to a further series of up to six SKA dishes that will form an Early Production Array (EPA), expected to be built on site from 2019 under the leadership of the SKA Organisation. The EPA will be used to demonstrate a working array, allowing engineers to spot any further design or production issues ahead of full-scale production. Additionally, it will for the first time provide an opportunity to integrate dishes with prototypes of other critical SKA elements provided by their respective design institutions such as the Signal and Data network, the Central Signal Processor where the signals from all dishes are correlated, the Science Data Processor (the imaging software) and the Telescope Manager software used to send commands to the dishes and monitor their status. “The EPA will allow us not only to bring production and construction forward but it will also allow us to test how key SKA components work together on the field. In essence, it’s bringing the various pieces of this puzzle together to see if they match and produce the image that we expect” concludes Joe McMullin, recently appointed as SKA Programme Director. 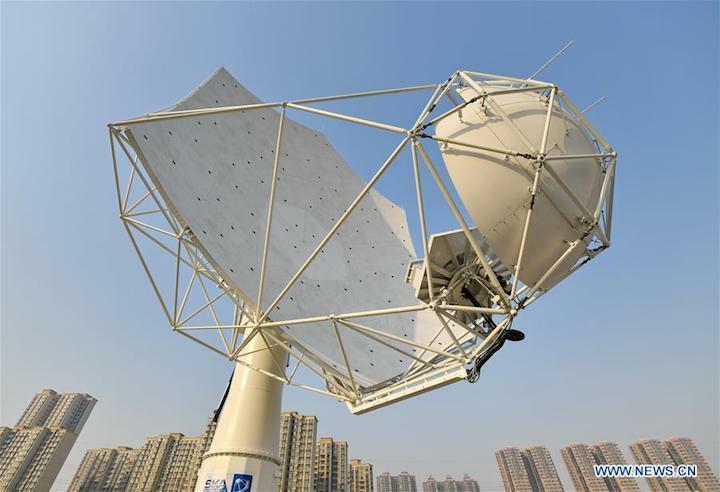 SHIJIAZHUANG, The first fully assembled dish for the Square Kilometer Array (SKA) radio telescope was unveiled Tuesday in Shijiazhuang, capital of north China's Hebei Province. The SKA, an international effort to build the world's largest radio telescope using arrays in Australia and South Africa, is not a single telescope, but a collection of telescopes or instruments, called an array, to be spread over long distances. After completion, the SKA will detect faint radio waves from deep space with a sensitivity about 50 times greater than that of the Hubble telescope. Individual radio telescopes will be linked to create a total collecting area of about 1 million square meters. The state-of-the-art 15-meter diameter dish unveiled Tuesday is one of two final prototypes that will be tested ahead of production of an early array. 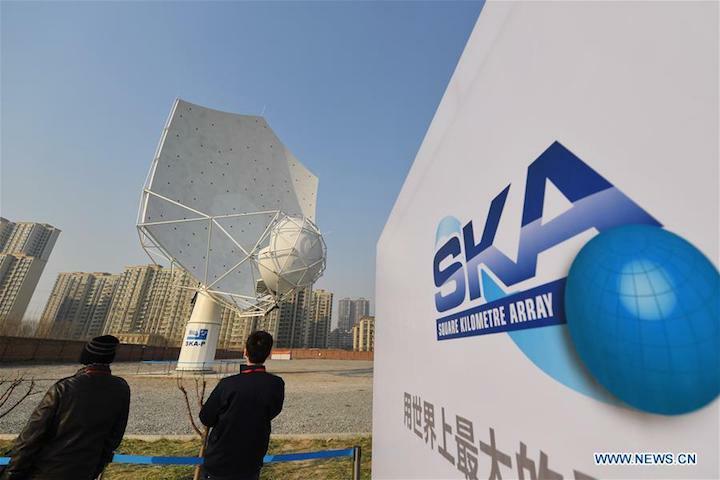 It is the first time China has played a leading role in the development of the SKA dish, showing that the country has made technological breakthroughs in radio telescopes, said Hao Jinxin, deputy head of the National Astronomical Observatories under the Chinese Academy of Sciences. "This is a major achievement by all the partners involved," said Philip Diamond, director-general of the SKA Organization, which is overseeing the project. "Our Chinese partners are extremely well resourced. They have demonstrated that they have the technology and capability to construct a telescope with the specifications that the SKA requires," added Mark Harman, SKA Organization project manager for the dish consortium. A second dish will be shipped to South Africa and assembled there to conduct real observations for the first time in the next few months, the SKA Organization said on its website. Supported by 10 member countries including China, Australia, Canada, South Africa and Britain, the SKA has attracted scientists and engineers from about 20 countries.